This week will explore singing and the sea, a long tradition which is uniquely intertwined and important for the distinct island culture in this very special place. We’ll be exploring the islands of the southern Outer Hebrides, led by sailor, teacher and musician Jenny Kinnear who will be teaching us shanties and Gaelic songs from the islands. We’ll also be aiming to go ashore in many of the small communities and seek out local singers and musicians to share our stories and hear theirs. While at sea we’ll be in a perfect environment to learn and explore song and the sea. Sailors have sung songs since time immemorial to keep up morale, pull together on the ropes, and tell their stories from strange lands. We’ll be continuing this tradition by doing the same! 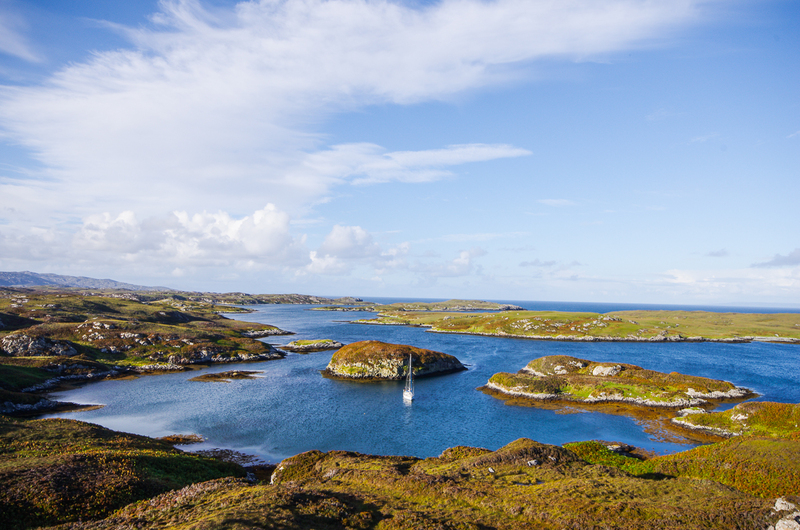 The week will also be a rare opportunity to explore some of the wild and remote places on the edge of the Atlantic which are not accessible from the land, such as the Wizard Pool on South Uist and Acairseid Fhallaich – Gallic for Secret Harbour – on the Isle of Ronay (below).